For anyone who would like a snapshot summary of Repetitive Strain Injury (RSI) or who is too busy to browse this whole site including past articles, this page is designed as a reference guide to RSI conditions from the perspective of a long term RSI sufferer. It’s really a complete summary of my understanding of RSI after 13+ years of living with the condition. 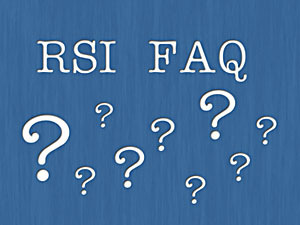 Please feel free to leave feedback (comments, suggestions and ratings) on this RSI FAQ at the bottom of this page. If you feel you have any content or links that would benefit and improve this FAQ then please submit via the comment section below and they will be duly considered for inclusion depending on relevance. You are also encouraged to share the knowledge in this page through the social bookmarking link at the bottom. If you find the information on this page useful, then please spread the word! Repetitive Strain Injury (RSI) is an umbrella term which encompasses various conditions related to overuse injuries of upper body limbs. It can affect any one or a combination of the neck, shoulder, upper arms, forearms, wrist, hands and fingers. There many different conditions covered by the RSI name. include (but not limited to) Carpal Tunnel Syndrome, tendinitis, Tennis Elbow, forearm cramping, tenosynovitis, de Quervain’s. It is often caused by carrying out tasks of a repetitive nature eg computer keyboard/mouse use coupled with bad posture which result in the body not functioning in the way that it was designed to do, causing damage to tendons, muscles and pinching of nerves. In the arms the muscles put under the most stress are the extensor (forearm) muscles which lift the wrist and control the fingers. Bad ergonomics can be a contributing factor, and can lead to muscle strains, pinched nerves, and general fatigue. The descriptive title Cumulative Stress/Trauma Disorder (CSD/CTD) although a bit of a mouthful, accurately describes the condition, ie every repetitive action such as a keystroke or mouse click will continue to incrementally worsen the condition over a long period of time unless some modifications are made to your working practice. The resulting RSI pain can vary from mild tingling to debilitating, and if the condition is left unaddressed, it can ultimately become a disability. A sufferer can exhibit just one or a combination of conditions, and can injure their arm/hands further by modifying their keyboard/mouse technique to compensate for their initial condition, eg using the thumb to do more work to reduce pain on forefingers. What are the trigger factors of RSI? RSI can be triggered by the long term micro movements in arm/hand muscles that are made in the process of typing at a keyboard and clicking a mouse. They are not normal full range muscle movements, and as such can restrict blood flow to those muscles. These muscles are very fatigued after working at a computer, and need blood flow for their supply of oxygen. Over time, these muscles can degenerate into a state of permanent fatigue, and are in continual pain. Tendons are stretched because of these tight muscles and cause pain propagation into the hands and fingers. Lack of warmth in the arms can curtail blood flow further to the hands and fingers. This can be exacerbated in heavily air conditioned work environments. Nerves which run down the arm travel through the neck and shoulder first, then down through the elbow, wrist and fingers. Bad posture can lead to compression or constriction of these nerves and cause pain, tingling and in worst cases loss of feeling. This is cumulative too so that if you have a bad posture and lose 10% of feeling in the neck, 10% in the shoulder, 10% in elbow and 20% in wrist, you may have finger tips with only 50% feeling left in their tips. The causes of stress are all around us in our daily lives. From busy commutes, to workload, to deadlines, to relationships, to bill payments – they all mount up. What stress does is makes us tense. This tension can manifest itself in tight muscle in the neck, shoulders, arms. Couple this with some bad posture and high exposure to computer use and you fall into a high risk category for developing an RSI. Also if you have an RSI condition already, the condition itself (pain and discomfort) can often be stressful on an individual, and this stress causes further tension in the arms and neck, leading to further pain – a positive feedback cycle (see my ‘Breaking the Pain cycle‘ article). Learning how to deal with the stresses involved can be a key part (although not the only part) of dealing with the condition. mental stress from the associated pain. What is the anatomy of RSI? What is the response of the medical profession to RSI? A sufferer may tell their doctor “I think I have RSI”, but often the doctor won’t agree on this definition since “RSI” is just a generic name. A typical reaction can be “RSI is not a medical condition”, which technically is correct, since it can be any one of a number of conditions, many of which your GP will not be aware of. You can sometimes be made to feel fraudulent and melodramatic complaining to doctors about these conditions, which is really more of an indication about the lack of awareness about RSI rather than anything personal. Often, a standard response of a doctor will be to prescribe painkillers (anti-inflammatory and/or neurological) – which more than likely won’t work, and to prescribe some physiotherapy which can have some short term benefits. Painkillers usually provide limited/no relief, which on reflection is probably a good thing because if they did work, they’d just mask the real underlying problem (bad posture, ergonomics, stress etc) while treating the symptoms – pain. In other words you could injure yourself further if RSI pain was masked by painkillers. Diagnosis of the exact RSI condition can be very tricky since the people specialising in RSI are few and far between. All of these can benefit, but will show diminished returns if you then go straight back to work and continue with the bad practices that cause RSI in the first place. A good RSI physiotherapist is hard to find. Often they can’t offer anything beyond ultrasound treatment and recommending the use of a wrist brace. With RSI having been around for a while now (>15 years) and with it reaching epidemic like proportions, we can all hope that the medical profession has started to recognise these conditions more fully. What are some of the alternative therapies that can be used to help RSI? There is a line of medical thinking out there that says that RSI is likely a condition of the mind see also here. If you think you are in pain then you can make yourself be in pain. Proponents of this line of thought propose that RSI can be treated psychologically. As I explain in my article ‘RSI – Mind over matter’ in my own experience I’d say the breakdown of mind (thoughts) over matter (physical pain) behind my RSI condition is 30%/70%. I do however believe that different people will have different ratios since we are all very different both physically and mentally. I also believe that the longer an RSI condition prevails, the more depressed and stressed the sufferer is likely to be about it. In the end, the correct solution is whatever works for you. What is the impact of RSI? There is a useful summary of facts and figures of RSI from the RSI Association. The statistics are alarming, and probably understated especially given recent news articles on the subject, along with the explosion in use of high technology devices and the Internet in our lives. Research published in 2008 found that RSI had increased by 30% that year. Employers are seeing ever-increasing absentee rates due to RSI type injuries. This results in lost working hours as well as sick pay, and also has the increased potential for legal personal injury claims by injured employees. There is no medical cure for many of the conditions and there is limited pain relief from medicines. It can lead to the loss of ability to do certain things eg in the worst case, some people can’t tie their own shoelaces. Even in the limited cases where surgery can help, eg carpal tunnel syndrome, the surgery has no guarantee of success, and can leave some with even worse conditions. Ultimately, RSI conditions can put your career at risk, meaning promotions are less likely, impacting your financial wellbeing. They can also impact other aspects of your life eg hobbies/interests/everyday tasks. In a worst case scenario you can end up with a permanent disability and you may have to walk away from your job completely. Am I at risk of developing a RSI condition? Is there any relief to RSI symptoms? I think/know I have a RSI condition what can I do? I’m in constant pain which wont go away what can I do? What can I do about my ergonomics/posture? Keep wrists in straight alignment with your arms. For multi keyboard commands eg CTRL+C, CTRL-V etc, use CTRL key with one hand and C key with other. Seek the advice of a professional ergonomist to get customised advice tailored to your needs. Check out the guide to Understanding Ergonomics at Work by the UK government HSE (health and safety executive). Are there alternatives to keyboards and mice? There are many alternatives to mice on the market, see my articles on Mice and RSI, and Alternatives to mouse clicking . Also visit my page listing some free RSI computer utilities that are readily available. You can consider voice recognition software, but it does have it’s limitations, and can take a lot of training. Computers controlled by gesture may be the next big thing in the world of ergonomics, but it is still in development stage, and currently aimed at the computer games market. This new form of interaction may also have it’s own set of ergonomic problems that we don’t yet know about. Especially if the upturn in injuries due to the use of games systems like the Wii are anything to go by. How can I avoid RSI? Avoid spending any ‘break time’ surfing! Consider installing a take-a-break alarm notice, or setting a timer to remind you when to take a break. Take what the ergonomist says seriously!! Consider a physical pastime that can benefit your muscle/tendon health and awareness, as well as aiding relaxation eg Yoga, Tai Chi and meditation. Consider obtaining 3 mice of different styles and shapes, and interchange the mouse you are using twice a day or more. The differing motions involved could help. Repetitive Strain Injuries are a real and present danger in today’s high technology driven life. Our bodies are doing tasks that they were not designed to do, and in a very repetitive manner. It is far easier to prevent RSI from happening than it is to cure it once you have it so don’t ignore the RSI pain however slight it is. Don’t be tempted to work through pain since it is your body’s way of telling you that you are not doing something right and it’s time to find out what that is and to make the necessary adjustments to your working/living practice. It is a collection of conditions affecting the upper body. It can affect any one or a combination of the neck, shoulder, upper arms, forearms, wrist, hands and fingers. It is caused by tasks of a repetitive nature coupled with bad posture which results in the body not being able to function as it was designed to do, and can cause damage to tendons, muscles and nerves, which can ultimately become permanent. In the arms the muscles put under the most stress are the extensor (forearm) muscles which lift the wrist and fingers. Bad ergonomics can be a contributing factor, and can lead to muscle strains, pinched nerves, and general fatigue. It is a Cumulative Stress (Trauma) Disorder (US term) meaning that every keystroke and click will continue to worsen the situation over a long period of time unless some modifications are made to your working practice. For thirty years I have been involved in all facets of computers, including many hours (Sometimes 14 hours a day graphic artwork and publishing. Working long hours using the conventional computer mouse I started to get RSI in the right arm and shoulder. I would have to stop my computer work for several days’ just to get some relief form the pain. I tried using my left hand but found it to difficult and awkward especially when doing fine work such as electronic diagrams and wiring layout design. So after some thought I simply reversed the mouse so the click buttons were facing me. This instantly resolved the problem as by holding the mouse with my thumb and middle finger and using my first finger to click the (left mouse button) which in the reverse position is on the right hand side of the mouse. The only movement is by bending the fingers. No movement of the arm, elbow or shoulder. Thus the area of RSI never again gets any further injury from mouse use. On the down side your brain will have to undergo readjustment as everything on the screen is in reverse. Still after a few days of usage in the reverse mode you will quickly adapt. Even your body will appreciate the cure from the curse of the dreaded RSI pain.